This may seem a bit odd, given my recent rant on meat substitutes, but I made a delicious Tempeh Club Sandwich this weekend thanks to Totally Vegetarian . I won’t post this as a “recipe” as it’s pretty simple (and I didn’t think of it). I browned some slices of tempeh, followed by adding a bit of tamari. 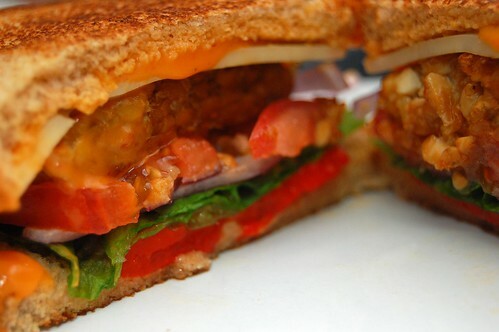 Stacked that on bread with lettuce, roasted red bell pepper, red onion, tomato, swiss and a bit of french dressing. Grilled that sucker up and it was delicious. Tempeh is, by far, my favorite meat substitute. « How about Banana Pudding instead? Haha, you’re a child-eater in an adult’s body! We should start doing comparative line-ups of we each have for dinner in a given. I’m sure the contrast would make for a good laugh.